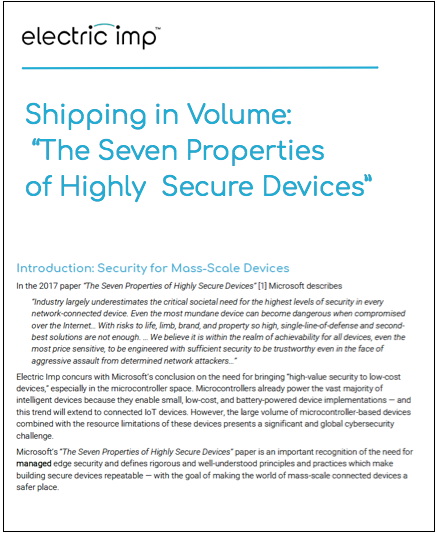 The Microsoft paper, “The Seven Properties of Highly Secure Devices” is an important turning point in the industry that defines the need for robust and repeatable security for the coming deployment of billions of IoT devices. In this paper we explain how the Electric Imp IoT Connectivity Platform achieves all seven properties of security described in the Microsoft paper. Download this paper and learn how Electric Imp can help you ship your connected devices securely and at scale.